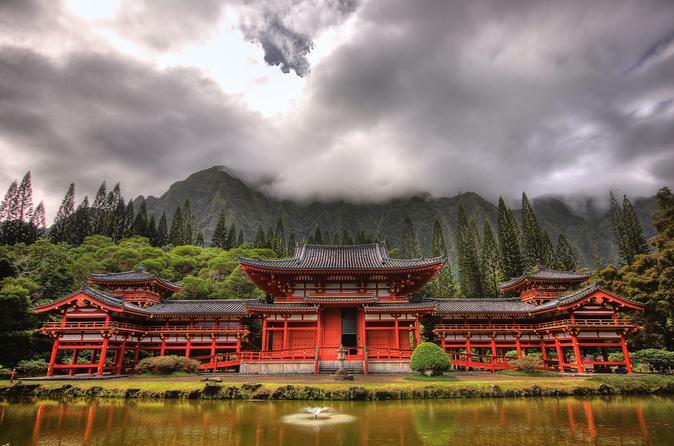 Let us show you the wonders that make Oahu the “Heart of Hawaii”. This complete full day tour is the perfect way to experience Oahu’s most scenic sights, unique culture and rich history. From Diamond Head Crater along the southern coast to the famous surfing beaches of the North Shore, you’ll take in a landscape that includes lush mountains and sparkling, turquoise waters. You’ll also stop at some fascinating locales. Kualoa Buffet Menu: Kualoa Field Green Salad, Fresh Pineapple Wedges, Kim Chee, BBQ Pork Ribs, Buttered Corn, Mango-Pineapple Teriyaki Chicken, Kualoa Chili, Steamed White Rice, Chef’s Choice of Dessert.